June 2018: Congratulations to Dr. Jennifer King on her thesis defense! June 2018: Welcome (back) to Dr. Jayanth Palanichamy as a Visiting Assistant Professor at UCLA! April 2018: Dinesh Rao is the Grand Rounds Speaker at the New York University Department of Pathology and Laboratory Medicine. April 2018: Congratulations to Dr. Jennifer King on her receipt of a K08 career development award from the NIH/ NIAMS. July 2017: Dinesh Rao is promoted to Associate Professor with tenure. July 2017: Congratulations to Thilini Fernando and the Rao lab for publication of a new paper on the role of lncRNA CASC15 in B-lymphoblastic leukemia. July 2017: The Rao lab receives a seed grant from Immunology, Inflammation, Infection and Transplantation (I3T) Research Theme at DGSOM. June 2017: The Rao lab receives an R21 grant from the National Institutes of Health/ National Institute of Allergy and Infectious Disease (NIH/NIAID). 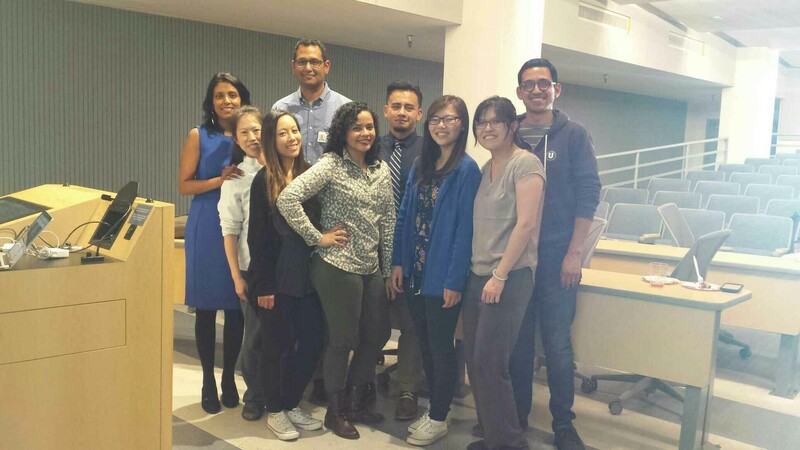 May 2017: Dinesh Rao presents for Grand Rounds at the Department of Laboratory and Genomic Medicine at Washington University. April 2017: Blood publishes an article by the O’Connell lab at the University of Utah , where Dinesh Rao was a collaborating author. January 2017: A chapter authored by Dinesh Rao and Jonathan Said, “Pathology and Molecular Pathology of Hematologic Malignancies”, appears in: Loda M, Mucci LA, Mittelstadt ML, Van Hemelrijck M, Cotter MB, editors. Pathology and Epidemiology of Cancer. January 2017: Dinesh Rao is appointed Director of Translational Research for the Department of Pathology and Laboratory Medicine. January 2017: Congratulations to Dr. Jennifer King, first author on a paper published in Frontiers in Immunology! January 2017: The Rao lab receives a research grant from STOPCancer and the Gary and Barbara Luboff Mitzvah Fund. Dinesh Rao is honored at a reception for the STOPCancer Foundation at UCLA on January 12. January 2017: The Rao lab receives a research grant from the Margaret E. Early Foundation. December 2016: Jennifer King presents her research at the 2016 Annual American Society of Hematology meeting. December 2016: Welcome to May Paing, our new lab manager. August 2016: Welcome to Dr. Amit Kumar, who has joined the Rao lab as a post-doctoral scholar. July 2016: Congratulations to Tiffany Tran, who received a T32 training grant from the Tumor Cell Biology Training Program. July 2016: Congratulations to Jorge Contreras, who received a T32 training grant from the Tumor Immunology Training Program. June 2016: Congratulations to Jorge Contreras, who successfully defended his Ph.D. Thesis. Dr. Contreras plans to spend another year in the Rao lab completing some additional research. May 2016: The Rao Lab receives a R21 grant from the NIH/NCI. April 2016: Congratulations to Dr. Nolan Ung, who received a T32 training grant in Developmental Hematology. March 2016 - Congratulations to co-first authors Jayanth K Palanichamy, Tiffany Tran, and Jonathan Howard from UCSC! See our newest publication, at the Journal of Clinical Investigation, at: http://www.jci.org/articles/view/80046. 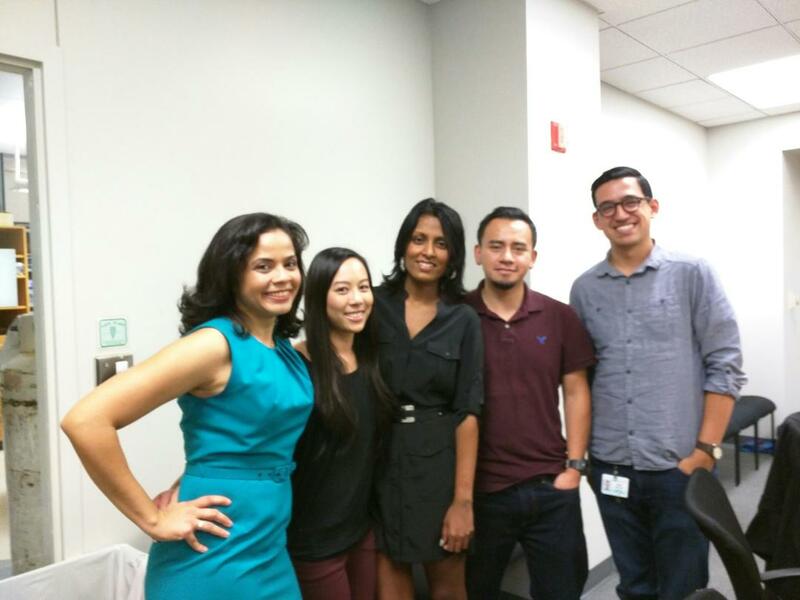 January 2015 - We bid farewell to Norma, who is on to a post-doctoral fellowship at Cedars-Sinai Medical Center! December 2015 - Congrats to Norma on her paper being accepted to Molecular Cancer! November 2015 - Congrats to Norma Rodriguez-Malave, who graduated with her Ph.D. in Cellular and Molecular Pathology. Well done, Dr. Rodriguez-Malave! 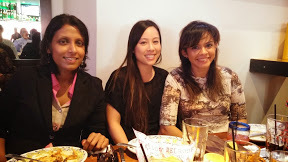 November 2015 - We bid farewell to Dr. Thilini Fernando, the first post-doc in the lab! Thilini did an amazing job working on lincRNAs, and is moving on to a project scientist position at Cedars-Sinai Medical Center. Congrats Thilini! April 2015- Welcome to Dr. Nolan Ung, who is our fourth post-doctoral fellow and an expert in image analysis! April 2015- Tiffany Tran was accepted into the Ph.D. program in Molecular Cellular and Integrative Physiology at UCLA. Congrats Tiffany! April 2015- The Rao lab's second publication is now published online. Congrats to Jorge Contreras. Read more. February 2015- We welcome our third post-doctoral fellow to the lab, Dr. Jaime Angiuano. Welcome to the Rao lab! February 2015- The Rao Lab's first publication with regards to long non-coding RNA is accepted for publication. Congrats to Thilini, Norma and Ella! Read more. November 2014- We bid farewell to Dr. Jayanth Palanichamy, who was appointed as a tenure-track assistant professor at the All India Institute of Medical Sciences, the most prestigious medical school in India. Congratulations, Professor! September 2014- The Rao Lab receives a supplement from the NIH Single Cell Analysis program to study single cell-level effects of microRNA function in B-cells. This was in collaboration with Dr. Alex Hoffmann. June 2014- We bid farewell to Jasmine Gajeton, undergraduate student in the lab, who is off to graduate school at Case Western Reserve University in Cleveland, Ohio. Congrats, Jasmine! June 2013- The Rao lab receives funding from the University of California Cancer Research Coordinating Committee. May 2013- We bid farewell to Ella Waters, who is off to graduate school at UC Berkeley. Congratulations, Ella! April 2013- Congratulations to Dr. Thilini Fernando, who received a training grant in Cancer Biology! Jan 2013- The Rao lab receives a R01 award from the NIH/NCI! 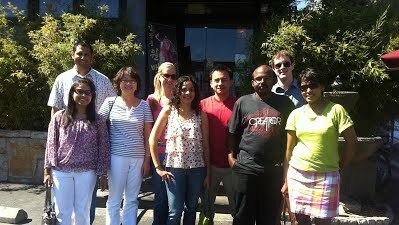 Nov 2012- We bid farewell to Neha Goswami, our first technician and thank her for all her work in the lab. Oct 2012- Jorge Contreras receives a training grant award from the UCLA tumor immunology program. Jun 2012- We bid farewell to Dr. Young A Kim, who spent a year with us as a visiting scholar. 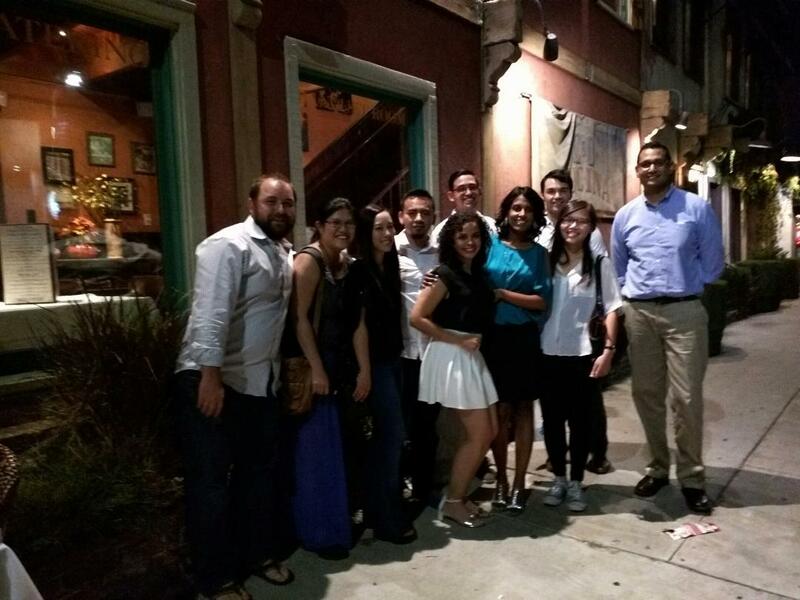 To celebrate, the lab travels to LA's Koreatown for some excellent Korean BBQ! May 2012- Welcome to Dr. Jayanth Palanichamy, a new post-doctoral fellow in the lab. 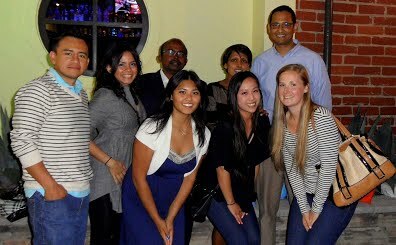 March 2012- Congratulations to Dr. Thilini Fernando, who received a training grant award in Developmental Hematology. February 2012- A review in the Journal of Hematology and Oncology, authored by Thilini Fernando, Norma Iris Rodriguez-Malave and Dinesh Rao is published. December 2011- A review in the journal Leukemia, authored by Jorge Contreras and Dinesh Rao is published. December 2011- Congratulations to Norma, who received a prestigious graduate fellowship from the National Science Foundation (NSF). November 2011- Welcome to Dr. Thilini Fernando, a post-doctoral fellow in the lab. September 2011- Welcome to Dr. Young A Kim, a visiting scholar from Seoul, Korea, and Abinav Baweja, a medical student, who are now part of the lab. August, 2 011- The lab celebrates one year in existence! July 1, 2011- An invited review on microRNAs in myeloid development by Dinesh Rao and others appears in the journalBlood. June 15, 2011- Two graduate students, Norma and Jorge, join the lab. May 22, 2011- Dinesh Rao receives a research grant from the Tower Cancer Foundation at the Foundation's 2011 Tower of Hope Gala in Beverly Hills, CA. May 15, 2011- Two papers regarding the dramatic inflammatory/cancer phenotype in miR-146a knockout mice, on which Dinesh is a co-author, are published in J. Exp Med and PNAS. May 1, 2011- Dinesh Rao receives a Kimmel Scholar Award for Cancer Research, funded by the Sidney Kimmel Foundation for Cancer Research. April 1, 2011- Dinesh Rao receives the Stein-Oppenheimer Endowment Award at UCLA. March 2014- A review in Frontiers in Genetics, authored by Jayanth Palanichamy and Dinesh Rao, is published. December 2013- Congratulations to Norma Iris Rodriguez-Malave, who was awarded the 2013 ASH Minority Graduate Student Achievement Award! December 2013- The Rao lab presents four abstracts at the annual ASH Meeting in New Orleans, LA. 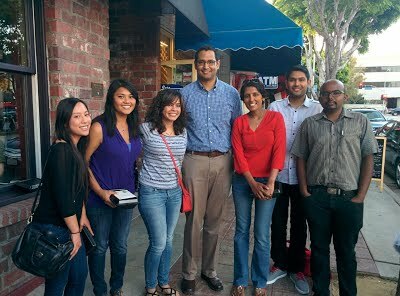 October 2013- Dinesh Rao becomes course director for a new course at UCLA, "Hematopoiesis: Basic Biology and Clinical Implications", which runs through the Fall Quarter. The speakers includenumerous basic scientific and clinical researchers at UCLA, Cedars-Sinai, and Caltech.